"These fun little caterpillars are a great way to feed your kids some fruit in a cute way. They are also great healthy snacks for a kids' birthday party or during a play date." 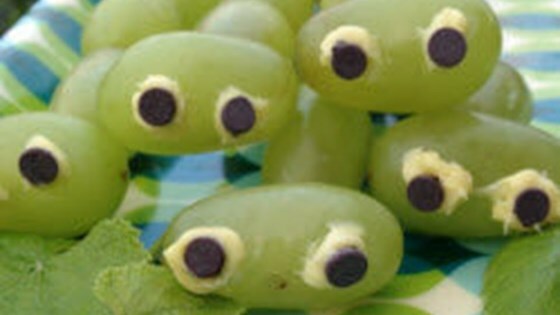 Pick out the 5 nicest looking grapes. Place 2 small dollops of cream cheese on each one for the eyes and stick in mini chocolate chips for the pupils. Thread 3 to 4 grapes, depending on length of your skewers, lengthwise onto a skewer, followed by the grape with the eyes horizontally. Repeat with the other grapes. This dessert salad is creamy with bursts of grape flavor. Instead of cream cheese you can also use frosting, mascarpone, or confectioners' sugar mixed with a little lemon juice. Or you can glue on sugar eyes. Made these for my grandchildren and they were a big hit!